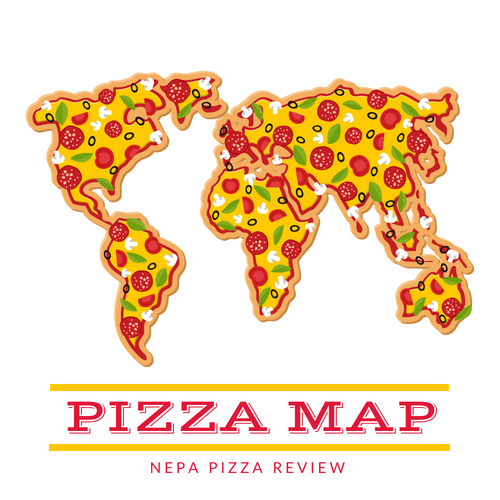 So in strategizing with the first lady of NEPA Pizza (and convincing her that we needed to go out for pizza AGAIN on a date) she suggested that I needed to take my reviews to an area of NEPA where I have not yet served in an effort to spread my wings and provide a more diverse product to more people. We tossed back and forth a few suggestion from my reader suggestions and settled that we would head to the Waymart Hotel II in Mount Cobb. 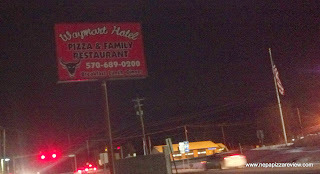 Now, since I have been to Waymart, PA before and eaten at the Waymart Hotel (1) many years ago, I found the name to be a bit strange since it was located in Mount Cobb. I'm sure there's a good reason for it, but I'll assume it's for continuity with the original place which has a good reputation. This restaurant in particular is a smaller place conveniently located just of I-84 across from the Burger King. It has a clean down-home tavern style interior with about 10 tables and a bar to eat at. 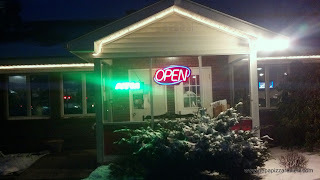 I assumed that this place is a hot takeout spot for the locals because people were continually lined up at the counter to pick up their pizzas. 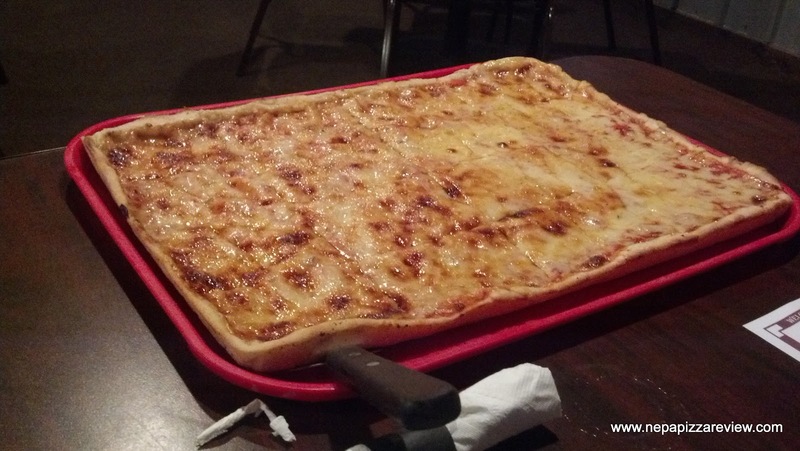 After sitting down, we decided to go with the house specialty "Hotel Original Red" pizza which is essentially an old forge pizza. It was ready in a jiffy and I immediately noticed that it was cooked properly with the cheese being browned in some places, but not burned. We took our first bites and found that the cheese was your standard American cheese, which might have been mixed with a little cheddar but I couldn't be certain. There is definitely some Parmesan sprinkled under the American though. The sauce was simple, neutral, and fairly well balanced with a nice flavor. The problem with the sauce was that it was not spread evenly across the pizza and some areas had very little, and some had a fair amount. It caused over half of the pizza to "taste like a grilled cheese sandwich" as the first lady so eloquently stated. I would have used a bit more sauce and applied it evenly over the entire pie. The crust was very thin for an old forge style pie, although I must say I did like it. It was a bit dense, but had a crunch to it which was kind of unique and is difficult to describe. I would say that the crust was my favorite part, and the nice thing is that you can probably eat 100 slices of this stuff because it is so thin. We both commented that we were still a bit hungry after eating a generous number of slices - now before you place judgements, I may have a giant appetite, but the first lady is VERY petite so you know this was a light pizza! I've heard the same thing about several other pizzas in the area - that you can eat it all day and never get full, but I must say I stopped eating not because I was full but because the flavors and textures got a little monotonous after a while. That certainly does not mean the pizza was at all bad, it just wasn't something that I wanted to eat half a tray of. The bottom line is, if you are in the Mount Cobb area, it's worth a trip in to grab a few pies. I saw first hand that the locals love it, but I'm not sure that I would schedule a road trip and go out of my way to get here. Overall, it's a safe bet and I think people would enjoy the pizza.